I worked at Deltares in Indonesia as a Local Young Expert. 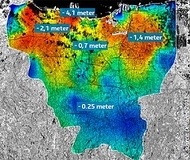 I focused on land subsidence phenomena in Jakarta area. As the contribution of each cause of subsidence in Jakarta was questionable. My responsibilities were developing subsidence model due to the groundwater abstraction and calculate the contribution to the total land subsidence in Jakarta. I also assisted young local researcher in groundwater modeling and hydrological modeling. My background is in Geodesy and Geomatics engineering. During my study I have a lot of experience about positioning and mapping technology/activities. I also joined in the research about land subsidence monitoring in Jakarta and Semarang, peat land subsidence monitoring in Central Java, and atmospheric modeling for geometric correction. I joined Deltares since November 2014 and my experiences in Deltares are about subsurface modeling, groundwater modeling, and hydrological modeling. Round-table discussion on Land Subsidence was held in Jakarta..